The Eagle Ford Shale drilling rig count increased six rigs to average 273 rigs running over the past week. That's just one rig off the 2013 high set three weeks ago. The U.S. rig count was down 15 to 1,786, of which 848 are running in Texas. A total of 387 rigs are targeting natural gas and 1,382 are targeting oil in the U.S. The remainder are drilling service wells (e.g. disposal wells, injection wells, etc.). TxDOT announced it has started converting paved roads to gravel in South Texas. 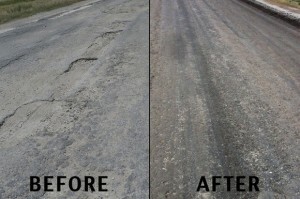 Paved roads can cost $500,000 per mile to maintain, but gravel roads are much cheaper at $10,000. Lawmakers have raised concerns and TxDOT has indicated that some road conversions have been delayed by 60 days. On a case-by-case basis, counties can ask the state to reconsider. Read more in the article: Will Paved Roads In The Eagle Ford Be Converted To Gravel? *Note* Now quoting Baker Hughes. Baker Hughes also releases its own Eagle Ford Rig Count that covers the 14 core counties (~234 rigs). The rig count published on EagleFordShale.com includes a 30 county area impacted by Eagle Ford development. A full list of the counties included can be found in the table near the bottom of this article. [ic-l]The natural gas rig count declined by three to settle at 40 rigs. That's still up from the low near 30 seen in April and June. Natural gas futures were trading around $3.50/mmbtu. The oil rig count increased eight rigs to 233 running in the region last week. WTI prices were trading near $106/bbl and have held above $100 for seven weeks. Eagle Ford light crude traded at $103/bbl on August 23rd. A total of 215 rigs are drilling horizontal wells and just 12 rigs are drilling true vertical wells. McMullen & Karnes counties lead development with 36 and 34 rigs running, respectively. See the full list of drilling by county below. Will Paved Roads In The Eagle Ford Be Converted To Gravel? hat is the Rig Count?